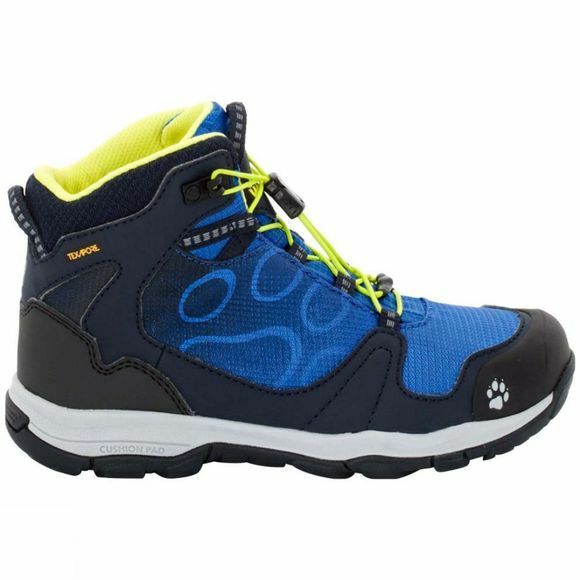 The Boys Akka Texapore Mid is a great little hiking boot for the junior world explorer. It does everything a proper boys' hiking boot should do. It is waterproof, supports the ankle and provides excellent grip on various types of terrain. The sole is designed to handle a wide range of activities–ideal for little outdoor fans who come up with a new plan every day! It provides the perfect combination of good flexibility and comfortable cushioning. And the special tread ensures good grip on any terrain. Given how versatile this shoe is it is remarkably light. This is partially due to the synthetic materials which also make the shoe hard wearing and easy to maintain. The speed lacing system is another practical feature–it can be adjusted with a quick tug on the draw cord. The inspiration for the Boys Akka Texapore Mid came from Mio Steingässer. Together with his family, Mio is folLowing the effects of climate change. The shoe is named after Akka, the highest mountain range in the Sami region of Sweden. This is where Mio Steingässer learned about how the Sami people live, and where he found a reindeer skeleton.